Customer Beaufort Financial Westerham are financial planners based in Westerham, specialising in investments, retirement and financial protection. We carried out this work for them as part of our regular air conditioning servicing contract. At present, we carry out a service of their equipment once a year. We carried out a regular service of Beaufort Financial Westerham’s multiple air conditioning units. There are ten units in total, five indoors and five outdoors. We completed the work in just one day, making this full service efficient and cost-effective for our customer. 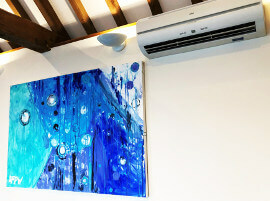 All air conditioning models in this property are Fujitsu, which is a reliable and highly-recommended brand. To keep working to their optimum efficiency, these units needs to be serviced at least once a year. We currently have an annual contract with Beaufort Financial Westerham to carry out the servicing and any maintenance work that is required after this. 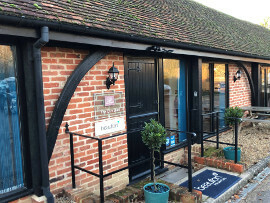 Thanks to our efficient service, Beaufort Financial Westerham can enjoy a comfortable office temperature courtesy of their fully functional and efficient Fujitsu air conditioning unit. There will usually be some signs that your air conditioning unit is due for its service – if you are ever unsure, you can check the documentation relating to your specific unit, which will give you details about the recommended servicing frequency. It begins making an unusual noise. Rattling noises, or louder noises than usual during operation, might indicate that your air conditioning unit is in need of a service. You notice the room isn’t as cool as it used to be. You might find that it is not cooling to the temperature you set, or your unit is actually blowing out warm air instead. Moisture or leaks. If you ever notice that you air conditioning unit is leaking, you should make sure it is serviced immediately and is repaired if needed as well. We arrange ongoing servicing contracts for customers in the Westerham and wider Kent areas, ensuring air conditioning units continue to function efficiently. If you would like to discuss your units, please do not hesitate to get in touch. Want to ask us a question about your own air conditioning needs? We help many customers in the Westerham and Kent areas, meeting their requirements in full.